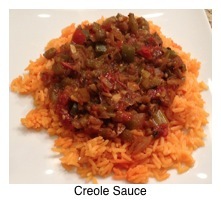 Creole Sauce | Cooking Wine And Travel - The site where Foodies Unite! My family is from the Creole country of Southern Louisiana, and we were literally raised on Creole-style cooking. This sauce is the staple of many dishes and can be used with chicken, fish, or even by itself with some well-cooked rice. In a large pan or cast iron skillet on medium to high heat, melt butter, then add the onions, bell pepper, and celery. Saute until vegetables are softened (about 3-5 minutes). Add garlic and shallots and cook for an additional 3 minutes. Add the Creole seafood seasoning, paprika, cayenne pepper, bay leaves, and chicken stock. Bring to a boil and cook until slightly reduced and thickened, about 5 minutes. Stir in the tomatoes and cook for 10 minutes longer until thick. 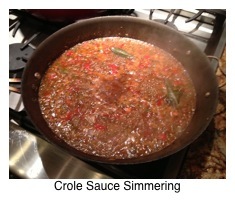 Stir in the Worcestershire sauce, hot sauce, salt, and reduce the heat to low. Simmer for 10 minutes. Serve over rice with seafood.